This month — with the full moon in your sign and Mars moving into Aquarius, you may feel like you can accomplish anything! This is a time for being innovative and dynamic and for creating your own personal magic, through the proper use of energy, action and initiative. 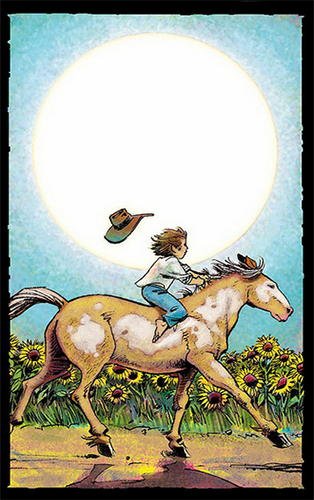 The Magician in this card — from Vanessa Decort’s gorgeous Sun and Moon Tarot — is seen delineating an astrology chart in heavens. An Ouroboros (world snake, known for devouring its own tail and swallowing itself, only to be born again and again) is placed around the chart wheel’s circumference. In the center of the wheel are the Magician’s tools — a wand, cup, sword and pentacle. Esoteric symbols (yin-yang, a lemniscate, eye of horus and horse-head talisman) are also seen inside the wheel. But the figure in this deck is not your typical Magician. He marches to the beat of his own drum. The Monkey in the foreground is also fitting as monkeys are known to be clever and playful creatures who embody the spirit of the Magi. Take some time to this month to think about what makes you unique and what skills you and you alone possess. Every one of us has something that we’re so passionate about — and properly channeled, this passion can become your calling. Be on the lookout this month for opportunities that are available to you, even those that may not be so readily apparent from your current vantage point. 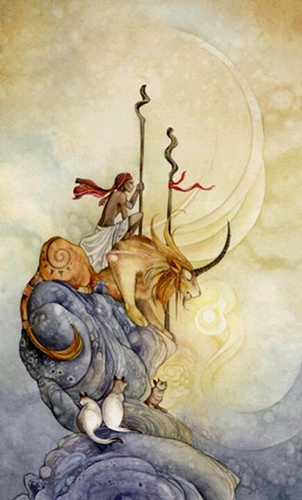 The Two of Wands — this version from the gorgeous Shadowscapes Tarot — speaks of having put an initial plan into action (with the Ace of Wands) and seeing it starting to gather momentum. It means that something has started to happen — something that’s big enough to assure you you’re on the right track, but not yet well-thought out enough to ensure that it’s a go. This could be something that was once just a dream or half-formed vision about where you see yourself “down the road.” You may be thinking of going back to school, or looking for another job or approaching someone you’re interested in and asking them out to dinner. It doesn’t have to be something big. But it can lead to something huge. 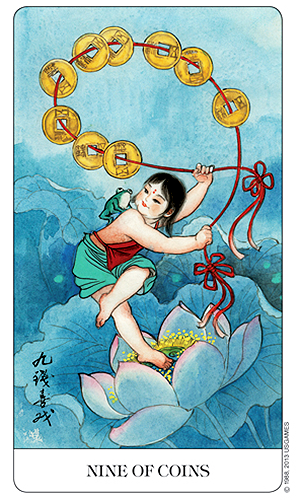 The Two of Wands asks, “What are you waiting for?” and “why are you holding back?” It tells you that there’s no time like the present to put yourself out there and take at least the first steps toward pursuing your goals. You may not have fully fleshed out your ideas. And that’s perfectly ok. 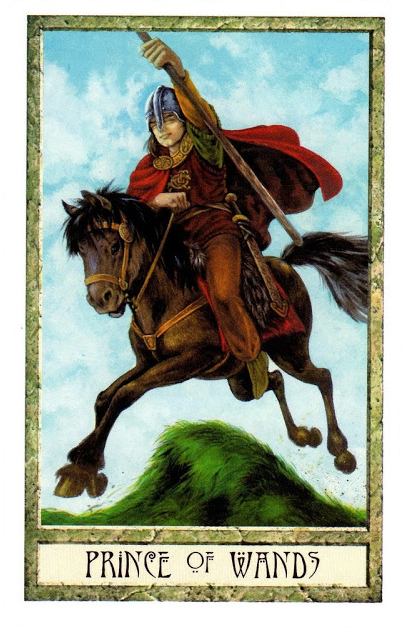 The Two of Wands speaks of putting something into action that will gather momentum over time. It encourages you to expand your horizons and reach for broader vistas. It speaks of taking a look at your long-term goals and acting on them with courage and conviction. If you’ve been hesitating due to fear or uncertainty, now is the time to put those worries aside. You’re already seeing how some moves are paying off, and are now in a position to take things to the next level. The Two of Wands says that all you aspire to is now within your grasp; you only need to gather up the courage and confidence to go after it. You may be on the verge of making important changes in your life, and in doing so will have to think about what you’re taking with you and what you need to leave behind. This doesn’t necessarily mean material things; in fact that’s rarely what it means. It’s more about attitudes and belief systems, as well as a life you may have built and dreams you may have dreamed that are no longer capable of sustaining you. 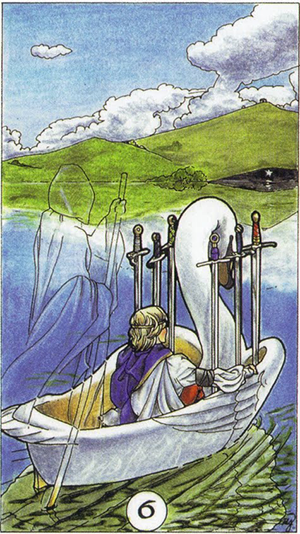 The Six of Swords — this version from the Morgan Greer Tarot — is a card of transition and change. Moving from one “place” to another, if only in your mind. Notice how the woman in this card is huddled and shrouded from view. She’s protecting herself from more than just the elements. She may be mourning the loss of her previous existence, or she may be reflecting on the choices she’s made to leave it all behind. She’s put her faith in the ferryman to get to her safely to her new destination. Notice too that while the waves are choppy beneath them, they start to smooth out the closer they get to the other shore. And speaking of that other shore, the landscape’s silhouette appears to be promising. It’s lush, flourishing and full of potential. This is the message behind the Six of Swords. You may not be where you want to be just yet, but you’re moving in the right direction. 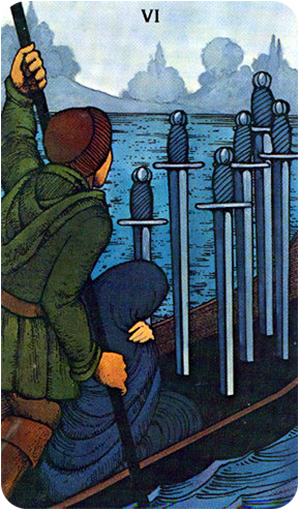 The Six of Swords reminds us that we’re not alone. We don’t get to the other side without assistance from someone, even when that “assistance” comes in the form of a setback that forces us to change direction. It also provides clarity and perspective. We may see things we don’t want to see — or admit to ourselves — but it’s that kind of clarity that motivates us toward change. Take some time this month to reflect on where you are and where you want to be heading. This is the first step, courtesy of the Six of Swords, toward manifesting your goals. This month — with several planets moving in and out of your sign — you’re hopefully going to be feeling more fully in your element. This should be a time of renewed opportunities to connect (or reconnect) with loved ones. 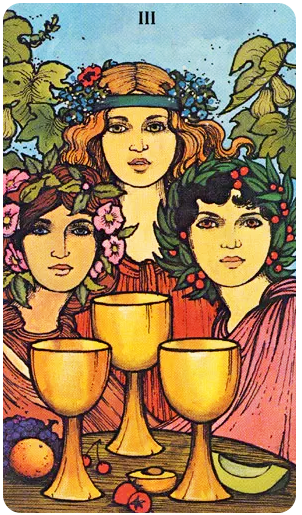 The Three of Cups — this version from the wonderful Morgan Greer Tarot — is a joyful and festive card that emphasizes partying and celebrating over work and responsibilities. It also emphasizes friends and casual relationships over serious romantic entanglements. It represents people gathering together to connect, interact and socialize. It’s a happy, joyful energy that can manifest as a party or celebration, or it could be as simple as a girls’ night out. Neptune goes direct today and brings with it a shift in energy that can guide you toward pursuing dreams that you may have recently put on hold. 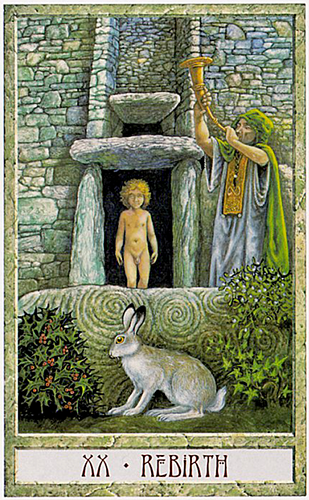 In this version of the card the ferryman is a spiritual being, guiding the young traveler to his destination. This ties in very well with the Neptune change in direction, especially if you recognize that there are greater forces at work in guiding you toward your goals. Notice the tiny light on the horizon — the beacon of light that tells you are moving in the right direction. You may be moving, changing jobs, ending a relationship, or releasing some baggage that’s been holding you back. 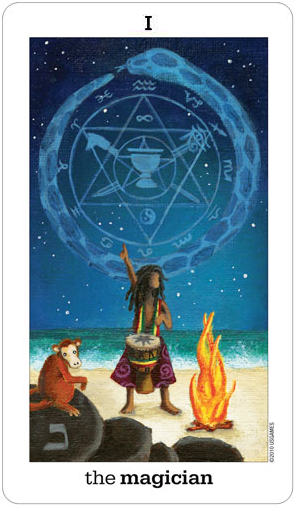 Although this card refers to change more than it does to endings, there are elements of “clearing the slate” that are a necessary part of this process. This is the message behind the Six of Swords. You may not be where you want to be just yet, but you’re moving in the right direction. It also provides clarity and perspective. We may see things we don’t want to see — or admit to ourselves — but it’s that kind of clarity that motivates us toward change. Take a moment today to reflect on where you are and where you want to be heading. This is the first step, courtesy of the Six of Swords, toward manifesting your goals. This is the month when wisdom meets hopes and dreams. 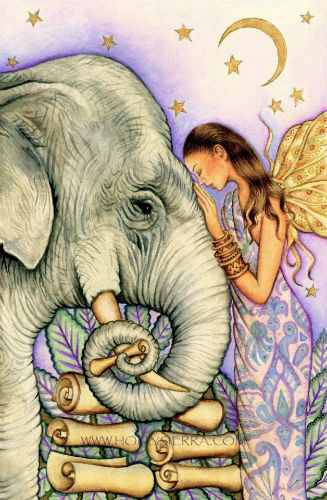 The elephant in this card — the Six of Scrolls from the beautiful Chrysalis Tarot — portrays that which is ancient and wise and the knowledge a person like this can bestow on you. Keep your ears open this month for one such as this because it seems as if they have something very wise and nurturing to give you in the form of words and knowledge. You may find that you go within yourself to draw out that which is wise and strong… that which you always knew. With this knowledge a transformation takes place within you. The point where the woman in this card touches the elephant’s forehead with her own is where the 6th chakra lays. This is where psychic information flows in and out and relays that the knowledge and wisdom you attain does not need to be from books but is simply “known” by you. The crescent moon and stars in the sky speak of mystery and mysticism as well as the turning of the ages. You may be thinking of taking a meditation class or psychic course. If these are not for you art, writing or anything creative can also give you the knowledge and wisdom you are looking for as it is already within you. This is a time when wisdom meets hopes and dreams. The elephant in this card portrays that which is ancient and wise and the knowledge which a person like this can bestow on you. Keep your ears open today for one such as this because it seems as if they have something very wise and nurturing to give you in the form of words and knowledge. There is almost a spiritual connotation to this card — the Six of Scrolls from the beautiful Chrysalis Tarot — as the colour purple surrounds the elephant (giver of wisdom and knowledge). The point where the woman in this card touches the elephant’s forehead with her own is where the 6th chakra lays. 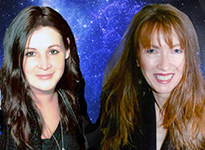 This is where psychic information flows in and out and relays that the knowledge and wisdom you attain does not need to be from books but is simply “known” by you. The crescent moon and stars in the sky speak of mystery and mysticism as well as the turning of the ages. 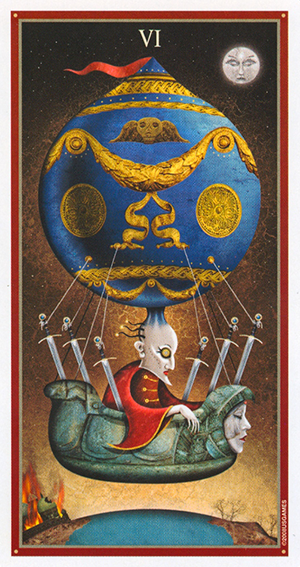 In this version of the card — from the Deviant Moon Tarot — we see the swords used practically and efficiently in the structure of a hot air balloon that is floating toward a better life. The balloon itself emanates from the woman’s head, a nice reference to the importance of using one’s head to overcome obstacles. The city burns behind her. The face on the front of the vessel is serene, and while the woman herself may be sad, she’s not looking back.